Very easy to get the sim. The staff is very nice. Love it. 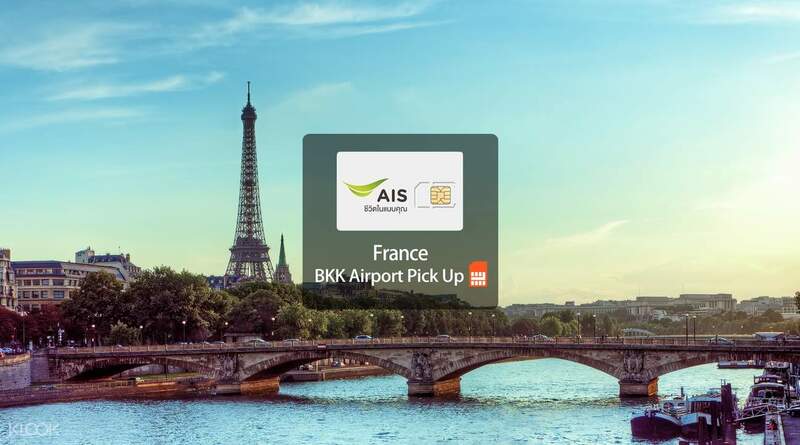 Explore France while staying connected with your friends and family by purchasing this 4G SIM card from AIS, one of the three main mobile operators in Thailand. Simply book the SIM card through Klook, then show your voucher at the AIRPORTEL counter in Suvarnabhumi Airport (BKK,) and you're good to go! Go online the moment you land at your destination with the simple activation procedure, and you'll enjoy unlimited 4G data valid for 15 days, perfect for sending those holiday snaps, looking at maps for directions, and staying on top of your emails. You'll also stay connected as you travel across borders with the SIM card's multi-country coverage, valid in up to 40 countries. Stay connected during your visit to France with this 4G SIM Card that you can pick up at Suvarnabhumi Airport (BKK) before your departure! Very easy to get the sim. The staff is very nice. Love it. Very easy to get the sim. The staff is very nice. Love it. To pick up SIM card. You will go to basement floor B1F asking for Klook counter then show voucher’s code then get the card. To pick up SIM card. You will go to basement floor B1F asking for Klook counter then show voucher’s code then get the card. To pickup SIM, you need to go to basement floor asking for KLOOK counter then get the item. To pickup SIM, you need to go to basement floor asking for KLOOK counter then get the item. It was an easy pick up. and able to use it in france. It was an easy pick up. and able to use it in france. Got the card smoothly, process was fast! Very easy and convenient. Got the card smoothly, process was fast! Very easy and convenient. Good connection and signal is good! Good connection and signal is good!